I have recently watched The atmospheric Gothic Horror story Crimson Peak again. Directed by Guillermo del Toro, (Pan’s Labyrinth) it is set around the turn of the 20th Century. It concerns Young Edith Cushing (Mia Wasikowska) the daughter of Carter Cushing, a wealthy businessman, is visited by her mother’s ghost who warns Edith: “Beware of Crimson Peak.” Over time Edith grows up to become a successful Ghost Story writer and meets the Aristocratic Sir Thomas Sharpe (Tom Hiddlestone) and his alluring sister Lady Lucille (Jessica Chastain), who are seeking investors, including Edith’s father Carter Cushing, for his revolutionary new clay mining invention, which he hope will make clay mining much safer. However Mr Cushing rejects Sir Thomas’ proposal. Shortly after this, Edith once again is visited by her mother’s spirit bearing the same dire warning. Edith finds out about how her father Mr Cushing bribed the Sharpes to leave, and now With nothing to stop them, Edith and Sir Thomas marry and return to Allerdale Hall, Cumberland, England, the Sharpes’ remote and rather dilapidated gothic mansion in the English Hills. Despite Edith’s best efforts, Lucille continues to act suspiciously cold and distant toward her. Then Whilst at Allerdale Hall Edith starts experiencing even more disturbing paranormal phenomena and seeing more gruesome ghosts, including her own mother, who again warns: “Beware of Crimson Peak”. Then Upon exploring Allerdale Hall further Edith discovers something even more disturbing and learns that Sir Thomas had previously married three wealthy women, all of whom died in mysterious circumstances. Edith Cushing gradually begins to suspect That Sir Thomas and his sister Lucille have an ulterior motive and are hiding some rather gruesome secrets. Then Edith begins to realize that her life might also be in great danger unless she can escape from Allerdale Hall. The late, great musician and bandleader, Lindley Armstrong “Spike” Jones sadly died 1 May 1965. He was born on December 14th 1879 and got his nickname from being so thin that he was compared to a railroad spike. At the age of 11 he got his first set of drums. As a teenager he played in bands that he formed himself. A railroad restaurant chef taught him how to use pots and pans, forks, knives and spoons as musical instruments. He frequently played in theater pit orchestras. In the 1930s he joined the Victor Young orchestra and thereby got many offers to appear on radio shows, including Al Jolson’s Lifebuoy Program, Burns and Allen, and Bing Crosby’s Kraft Music Hall. From 1937 to 1942, he was the percussionist for the John Scott Trotter Orchestra, which played on Bing Crosby’s first recording of White Christmas. The City Slickers evolved out of the Feather Merchants, and made experimental records and performed publicly, gaining a small following. The original members included vocalist-violinist Carl Grayson, banjoist Perry Botkin, trombonist King Jackson and pianist Stan Wrightsman.Throughout the 1940s and early 1950s Spike Jones and his City Slickers enjoyed huge success, with their satirical arrangements of popular songs. Ballads and classical works, which after receiving “the Jones treatment” would be punctuated with gunshots, whistles, cowbells, and outlandish vocals and sounded absolutely hilarious. Among the best known satirical recordings were humorous takes on the classics such as the adaptation of Liszt’s Liebesträume, played at a breakneck pace on unusual instruments. Others followed: Rossini’s William Tell Overture was rendered on kitchen implements using a horse race as a backdrop, with one of the “horses” in the “race” likely to have inspired the nickname of the lone SNJ aircraft flown by the US Navy’s Blue Angels aerobatic team’s shows in the late 1940s, “Beetle Bomb”. 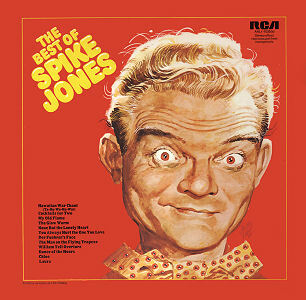 In live shows Spike would acknowledge the applause with complete solemnity, saying “Thank you, music lovers.” A collection of these 12 “homicides” was released in 1971 as Spike Jones Is Murdering the Classics. They include such tours de force as Pal-Yat-Chee (Pagliacci), Ponchielli’s Dance of the Hours, Tchaikovsky’s None but the Lonely Heart, Flight of the Bumble-Bee and Bizet’s Carmen. Then In December 1945 Spike released his version of Tchaikovsky’s Nutcracker Suite, arranged by Joe “Country” Washburne with lyrics by Foster Carling. Sadly The rise of rock-’n’-roll during the 1950′sand the decline of big bands hurt Spike Jones’ repertoire. The new rock songs were already novelties, and Jones could not decimate them the way he had lampooned “Cocktails for Two” or “Laura.” He played rock-’n’-roll for laughs when he presented “for the first time on television, the bottom half of Elvis Presley!” This was the cue for a pair of pants — inhabited by dwarf actor Billy Barty — to scamper across the stage. Jones adapted to changing tastes. In 1950, when America was nostalgically looking back at the 1920s, Jones recorded an album of Charleston arrangements. In 1953 he responded to the growing market for children’s records, with tunes aimed directly at kids (like “Socko, the Smallest Snowball”).In 1956 Jones supervised an album of Christmas songs, many of which were performed seriously. In 1957, he revamped his own act for television. Gone was the old City Slickers mayhem, replaced by a more straightforward big-band sound, with tongue-in-cheek comic moments. The new band was known as Spike Jones and the Band that Plays for Fun. He also recorded a cover of “Dominique” with Spike Jones’ New Band in 1964, a hit by The Singing Nun, in which he not only plays part of the melody on a banjo but melds the melody successfully with “When the Saints Go Marching In!” The last City Slickers record was the LP Dinner Music For People Who Aren’t Very Hungry. The whole field of comedy records changed from musical satires to spoken-word comedy (Tom Lehrer, Bob Newhart, Mort Sahl, Stan Freberg). Spike Jones adapted to this, too; most of his later albums are spoken-word comedy, including the horror-genre sendup Spike Jones in Stereo (1959) and Omnibust (1960). Jones remained topical to the last: his final group, Spike Jones’ New Band, recorded four LPs of brassy renditions of pop-folk tunes of the 1960s (including “Washington Square” and “The Ballad of Jed Clampett”). Jones was a lifelong smoker. He was once said to have gotten through the average workday on coffee and cigarettes. Smoking may have contributed to his developing emphysema. His already thin frame deteriorated, to the point where he used an oxygen tank offstage, and onstage he was confined to a seat behind his drum set. He sadly died on May 1, 1965 and is buried in Holy Cross Cemetery, Culver City, California. Generally regarded as one of the greatest F1 drivers to have raced, the Brazilian driver & three-time Formula One world champion Ayrton Senna was tragically killed 1st May 1994 in a crash at Tamburello corner while leading the 1994 San Marino Grand Prix at Imola. Senna was born in Santana near Sao Paulo on 21st March 1960 and began his motorsport career in karting, moving up to open-wheel racing in 1981, and winning the British Formula 3 championship in 1983. Ayrton Senna began his motorsport career in karting, moving up to open-wheel racing in 1981, and winning the British Formula 3 championship in 1983. He made his Formula One debut with Toleman-Hart in 1984 before moving to Lotus-Renault the following year and winning six Grands Prix over the next three seasons. In 1988, he joined Frenchman Alain Prost at McLaren-Honda. Between them, they won all but one of the 16 Grands Prix that year and Senna his first World Championship. Prost claimed the championship in 1989, and Senna his second and third championships in 1990 and 1991. In 1992, the Williams-Renault combination began to dominate Formula One. Senna nonetheless managed to finish the 1993 season as runner-up, winning five races and negotiating a move to Williams in 1994. Senna was recognised for his qualifying speed over one lap and from 1989 until 2006 held the record for most pole positions. He was especially quick in wet conditions, as shown by his performances in the 1984 Monaco Grand Prix, the 1985 Portuguese Grand Prix, and the 1993 European Grand Prix. He also holds the record for most victories at the prestigious Monaco Grand Prix – six – and is the third most successful driver of all time in terms of race wins. Senna courted controversy throughout his career, particularly during his turbulent rivalry with Alain Prost. Both the 1989 Championship won by Prost and the 1990 Championship won by Senna were decided by collisions between them at those years’ Japanese Grands Prix. English musician, songwriter and record producer Bernard Joseph Butler was born born 1 May 1970. He is best known as the first guitarist with Suede, until his departure in 1994. He has been hailed by some critics as the greatest guitarist of his generation; BBC journalist Mark Savage called him “one of Britain’s most original and influential guitarists”. He was voted the 24th greatest guitarist of the last 30 years in a national 2010 BBC poll and is often seen performing with a 1961 cherry red Gibson ES-355 TD SV (Stereo Varitone) with a Bigsby vibrato tailpiece. Butler also names former Smiths guitarist Johnny Marr as his major inspiration. He first achieved fame in 1992 as the guitarist with Suede, forging a songwriting partnership with Brett Anderson. He co-wrote and played guitars on every recording until 1994, when he exited Suede, leaving behind the Mercury Music Prize-winning debut Suede, as well as the follow-up Dog Man Star. Immediately after leaving Suede he formed the duo McAlmont and Butler with David McAlmont and they released two singles, “Yes” and “You Do”. A compilation album, The Sound of McAlmont and Butler, was also released. Butler then released two solo albums under his own name, People Move On and Friends and Lovers, on Creation Records, yielding the hit single “Stay”. In 2001 Butler teamed up with McAlmont for a second McAlmont and Butler album, Bring it Back, and they toured the UK after the release of two singles, “Falling” and “Bring it Back”. In 2004 Butler formed a new band with Brett Anderson, The Tears, based on the same style that yielded their first successes with Suede in the early 1990s. The Tears released their debut LP, Here Come The Tears, produced by Butler, in June 2005. Singles include “Refugees”, which reached number 9 in the UK Singles Chart, and “Lovers”. In 2009 Butler co-wrote/produced/played on tracks by The Veils, Tommy Reilly, Jonathan Jeremiah, Kate Jackson and Catherine A.D who now performs as The Anchoress. He also worked on Kate Nash’s second album My Best Friend Is You. Butler also worked with Nerina Pallot, Fyfe Dangerfield, Noisettes, Slow Club, Gabrielle, Howling Bells, The Veils, Simon Dine, and new artists Jodie Marie, Vince, Daley, Summer Camp, Joe Worricker and Scott McFarnon. Butler also produced albums for Frankie & The Heartstrings and the album Days & Nights. He also co-wrote and produced Texas’s comeback album The Conversation. In 2013 Butler worked with the group Teleman, to finish their debut album; he also worked on songs with London group Flowers; and collaborated with Paloma Faith and Fyfe Dangerfield. In 2013, he sang an impromptu improvisational performance at the Sunderland record store run by Frankie & The Heartstrings. Alongside members of Warm Digits, Field Music and 1990s and also played two shows at The Slaughtered Lamb in London, UK, accompanying Ben Watt on electric guitar. In 2013, new group Trans released the red EP, the first in a series of EPs for Rough Trade Records with Jackie McKeown, Paul Borchers and Igor Volk In February 2014, Butler played two lives shows with Watt at London’s St Pancras Old Church, preceding the release of Watt’s solo album Hendra. Butler also joined Watt on an eight-show UK tour in support of the album. Butler played again with Watt in November 2014 as part of the Ben Watt Trio. Butler also organised two special McAlmont & Butler performances to raise funds for The Bobath Centre’s work with children with cerebral palsy. The London shows at the Union Chapel and Islington Assembly Hall sold out, and the duo were accompanied by a full band that consisted of members of The Magic Numbers, Mako Sakamoto on drums and Sean Read on keyboards. Butler also created the soundtrack to the 1997 film The James Gang and played on the soundtrack of Velvet Goldmine, alongside Thom Yorke and Jonny Greenwood of Radiohead. American musician-guitarist, singer-songwriter, producer and actor Ray Parker Jr. born May 1, 1954 in Detroit to Venolia Parker and Ray Parker Sr. He has two siblings, his brother Opelton and his sister Barbara. Parker attended Angel Elementary School where music teacher, Afred T Kirby inspired him to be a musician at age 6 playing the clarinet. Parker attended Cass Tech High School in the 10th grade. Parker graduated in 1971 from Detroit’s Northwestern High School. He was raised in the Dexter-Grand Boulevard neighborhood on its West Side. Parker attended college at Lawrence Institute of Technology. Parker gained recognition during the late 1960s as a member of Bohannon ‘s house band at the legendary 20 Grand nightclub. This Detroit hotspot often featured Tamla/Motown acts, one of which, the (Detroit) Spinners, was so impressed with the young guitarist’s skills that they added him to their touring group. Through the Bohannon relationship at 16 he recorded and co-wrote his first songs with Marvin Gaye. Parker was also employed as a studio musician as a teenager for the emergent Holland-Dozier-Holland’s Invictus/Hot Wax stable, and his choppy style was particularly prevalent on “Want Ads”, a number one single for Honey Cone. Parker was later enlisted by Lamont Dozier to appear on his first two albums for ABC Records. In 1972, Parker was a guest guitarist on Stevie Wonder’s funk song “Maybe Your Baby” from Wonder’s album Talking Book. He also was the lead guitarist for Stevie Wonder when Wonder served as the opening act on the Rolling Stones 1972 tou In 1973, he worked with Barry White’s The Love Unlimited Orchestra, before creating Raydio, an R&B group, in 1977, with Vincent Bohnam, Jerry Knight, and Arnell Carmichael. Parker appeared briefly in the 1974 film Uptown Saturday Night as a guitar player in the church picnic scene. Parker also wrote songs and did session work for The Carpenters, Rufus and Chaka Khan, Aretha Franklin, Stevie Wonder (an association which prompted a permanent move to Los Angeles), Deniece Williams, Bill Withers, Michael Henderson, Jean-Luc Ponty, Leon Haywood, The Temptations, The Spinners, Boz Scaggs, David Foster, Rhythm Heritage, Gladys Knight and the Pips, The Honey Cone, Herbie Hancock, Tina Turner, and Diana Ross. His first bona fide hit as a writer was “You Got the Love”, co-written with Chaka Khan and recorded by Rufus. The single hit #1 on the R&B charts and #11 on the pop charts in December 1974. According to a special mention, in 1976 he worked as rhythmic guitarist for Lucio Battisti’s album Io tu noi tutti, translated as “Me you and all of us”. Parker endorses and plays Mérida Guitars. After Raydio broke up in 1981. Parker continued with his solo career, scoring six Top 40 hits, including the hit singles “The Other Woman” and “Ghostbusters” which was also nominated for an Academy Award for Best Original Song in 1984 but lost to Stevie Wonder’s “I Just Called to Say I Love You” from The Woman in Red. Parker’s song secured him a 1984 Grammy Award for Best Pop Instrumental Performance. He also recorded “I Still Can’t Get Over Loving You” and “Jamie”. Parker was one of the first black artists to venture into the then-fledgling world of music videos. In 1978, Hollywood producer Thom Eubank produced several music videos of songs by Raydio’s including “Jack & Jill” and “The Other Woman”. Parker also wrote and produced hits for New Edition (“Mr. Telephone Man”), Randy Hall, Cheryl Lynn (“Shake It Up Tonight”), Deniece Williams (“I Found Love”) and Diana Ross. He performed guitar on several songs on La Toya Jackson’s 1980 debut album. In 1989, he also wrote “Ghostbusters”, a rap performed by Run-D.M.C., for the movie Ghostbusters II. In 1989 Parker worked with actor Jack Wagner (General Hospital) on an album, which contained the song “Wish You Were Mine”, which featured an intro rap by Parker. In 2006, Parker released a new CD titled I’m Free. Parker is also the founder and owner of the Los Angeles-based recording facility Ameraycan Recording Studios. In July 2016, Parker performed on ABC’s Greatest Hits. In 2014, Parker was invited by producer Gerry Gallagher to record with Latin rock legends El Chicano, Alphonse Mouzon, Brian Auger, Alex Ligertwood, Siedah Garrett, Walfredo Reyes Jr., Spencer Davis, Lenny Castro, Vikki Carr, Pete Escovedo, Peter Michael Escovedo, Jessy J, Marcos J. Reyes, Salvador Santana, and David Paich and is featured on guitar on the song “Something Got Me Started” from Gallagher’s most recent studio album due out in 2017. Parker has also appeared on many television programmes including Gimme a Break, Pryor’s Place (for which Parker appeared in the opening title sequence singing the theme song), Disorderlies, Enemy Territory, Charlie Barnett’s Terms of Enrollment, two episodes of Berrenger’s, and Uptown Saturday Night (1974). He was also a production assistant for the film Fly by Night and made guest appearances on 21 Jump Street and Kids Incorporated. In early 2009, Parker appeared in a television advertisement for 118 118. In 2014, Parker appeared in the fifth episode of the first season of NBC’s romantic comedy television series A to Z, singing the “Ghostbusters” theme song for a Halloween party. Ray Parker also appeared onTV One’s series, Unsung. American musician D’arcy Wretzky-Brown was born May 1, 1968. She was raised in South Haven, Michigan, where her mother, a musician working as a lounge singer, encouraged D’arcy and her sisters to perform music. Growing up, she played the violin and oboe, and performed in choirs. She also performed gymnastics. Wretzky intended to start a musical career since she was 10 years old. She would later refer to her father, a pipefitter with a love of horseback riding, as “a very strange man.” The young Wretzky was a self-described “tomboy,” and had a contentious relationship with her sister. Wretzky attended South Haven’s L.C. Mohr High School, where she grew interested in post-punk and played in cover bands. After high school, she moved to France to join a band, but the band had already disbanded upon her arrival, prompting her to return to the United States. She then moved to Chicago and spent the summer living with friends and attending concerts. Wretzky stated that she is a self-taught bass player. Wretsky joined the Smashing Pumpkins after a concert at a local rock club, When she overheard Billy Corgan criticizing the band that had performed. An argument and discussion followed, and Corgan recruited her into his band, the nascent Smashing Pumpkins, which, at the time, was merely Corgan, James Iha, and a drum machine. Wretzky was joined by Jimmy Chamberlin a few months later, after Joe Shanahan encouraged Corgan to add a live drummer. Wretzky is the credited bassist on the Smashing Pumpkins’ first five studio albums: Gish, Siamese Dream, Mellon Collie and the Infinite Sadness, Adore, and Machina/The Machines of God. It was confirmed by both her and Corgan, however, that Corgan played the bass tracks for Siamese Dream because he could complete them in far fewer takes. Wretzky also contributed backing vocals in concert, and on many songs including “Daydream” from Gish, many songs on Siamese Dream, “1979”, “Cupid De Locke”, “Farewell and Goodnight”, “Beautiful”; “Where Boys Fear To Tread” from Mellon Collie, and “Dreaming” and “The Bells” from The Aeroplane Flies High. Wretzky also co-wrote one Smashing Pumpkins song, “Daughter”. Wretzky’s time in the band was marked by alternating periods of happiness and discomfort. Corgan considered her the “moral authority” and “moral conscience” of the band. In the aftermath of the success of 1995’s Mellon Collie and the Infinite Sadness, Corgan said she began an “apparent slow descent into insanity and/or drugs.” After “The Arising!” tour in April 1999 which saw all four original members performing together for the first time since 1996, Wretzky decided to leave the band with intentions of pursuing an acting career. The band was recording Machina/The Machines of God at the time and consequently she performed very few bass parts on the album. Most of the bass parts were handled by Corgan himself. Shortly after leaving the group, she was arrested for possession of crack cocaine. Corgan later said she was “fired for being a mean spirited drug addict who refused to get help.” She was replaced on 2000s Machina tour by former Hole bassist Melissa Auf der Maur. Wretzky did not participate in the Smashing Pumpkins’ reunion. In 2008, she and her former bandmate James Iha filed a lawsuit against Virgin Records for selling ringtones of Smashing Pumpkins songs without their consent. Wretzky is a Sci-Fi fan of both Star Trek and the X-Files. She has stated that space travel and aliens are a recurring influence on her creative ideas, and still a possible influence on acting aspirations and the talked about future plans for a solo album. In 2009 Wretzky Called in unexpectedly on Chicago’s Q101 FM with Ryan Manno. During the interview, she professed her admiration for Monkees frontman Davy Jones who was known to be an early romantic crush of Darcy’s. She also discussed her appreciation for the band Silversun Pickups She also mentioned that she then lived on a farm in Michigan, that she had briefly lived in Austin, Texas, sometime during the previous decade, and that former fiancé Wendell Green had died. Sadly Wretzky was jailed in February 2011 for missing four court dates related to a ticket she received for failing to control her horses. She spent six days in jail. She was also arrested on February 7, 2011, on a misdemeanor drunken-driving charge in South Haven, Michigan.